The following is from a magazine article published in 'And It Is Divine' circa 1977. 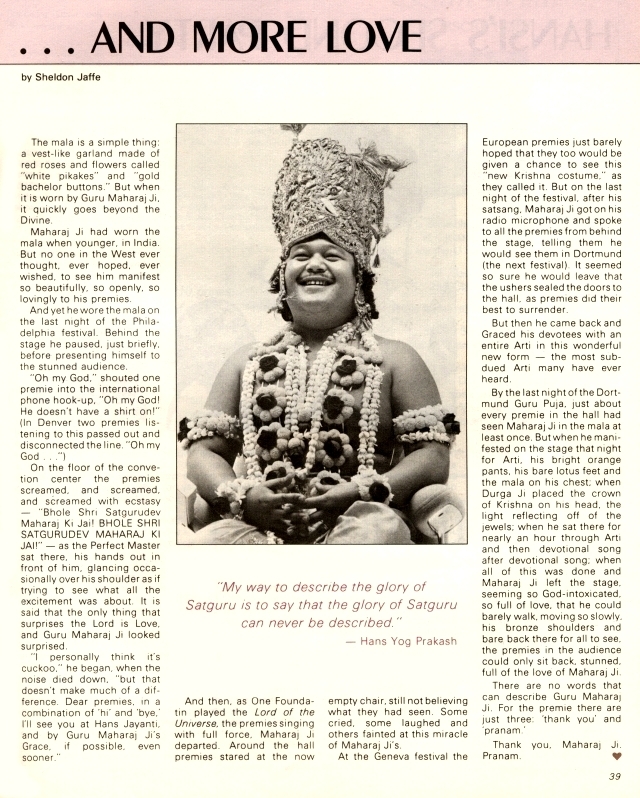 On the floor of the convention center the premies screamed and screamed and screamed with ecstasy - "Bhole Shri Satgurudeve Maharaj Ki Jai, BHOLE SHRI SATGURUDEV MAHARAJ KI JAI" - as the Perfect Master sat there, his hands out in front of him, glancing occasionally over his shoulder as if trying to see what all the excitement was about. It is said that the only thing that surprises the Lord is Love, and Guru Maharaj Ji looked surprised. "I personally think it's cuckoo," he began when the noise died down, "but that doesn't make much of a difference. Dear premies, in combination of hi and bye I'll see you at Hans Jayanti and by Guru Maharaj Ji's Grace, if possible even sooner." And then as One Foundation played the Lord of the Universe, the premies singing with full force, Maharaj Ji, departed. Around the hall premies stared at the now empty chair, still not believing what they had seen. Some cried, some laughed and others fainted at this miracle of Maharaj Ji's. At the Geneva festival the European premies just barely hoped that they too would be given a chance to see this "new Krishna costume," as they called it. 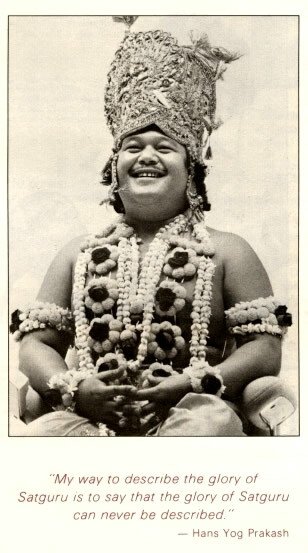 But on the last nigh of the festival after his satsang, Maharaji, got on his radio microphone and spoke to all the premies from behind stage telling them he would see them in Dortmund (the next festival). It seemed so sure he would leave that the ushers sealed the doors to the hall as premies did their best to surrender. But then he came back and Graced his devotees with an entire Arti in this wonderful new form - the most subdued Arti, many have ever heard. By the last last night of the Dortmund Guru Puja, just about every premie in the hall had seen Maharaji Ji in the mala at least once. But when he manifested on the stage that night for Arti, his bright orange pants, his bare lotus feet and the mala on this chest; when Durga Ji placed the gown of Krishna on his head, the light reflecting off of the jewels; when he sat there for nearly an hour through Arti,and then devotional song after devotional song; when all of this was done and Maharaj Ji left the stage, seeming so God-intoxicated, so full of love, that he could barely walk, moving so slowly, his bronze shoulders and bare back there for all to see, the premies in the audience could only sit back, stunned full of the love of Maharaj Ji. There are no words that can describe Guru Maharaj Ji. For the premie there are just three: "thank you"and "pranam." Thank you, Maharaj Ji. Pranam.